Provident Housing Ltd. is a wholly owned subsidiary of Puravankara Projects Ltd.
Its project Provident Cosmo City in Pudupakkam near Siruseri IT park has got DTCP approved plan and construction is to commence in April 2009. A total of 2174 apartments are to be constructed in 31 acres, of which 518 are supposed to be built in the first phase. 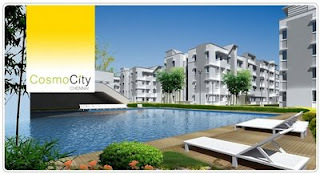 The apartments are to come up in 983 to 1062 sqft size and at a rate of Rs.1780/sqft. The total cost is around 16.90 lakhs to 18.90 lakhs.